Posted on February 28, 2012 by Deli Lanoux, Ed.D. Last week I finally got the answer to a question I’d pondered since November, 2009: Who started the devotion to the Child Jesus in pink? 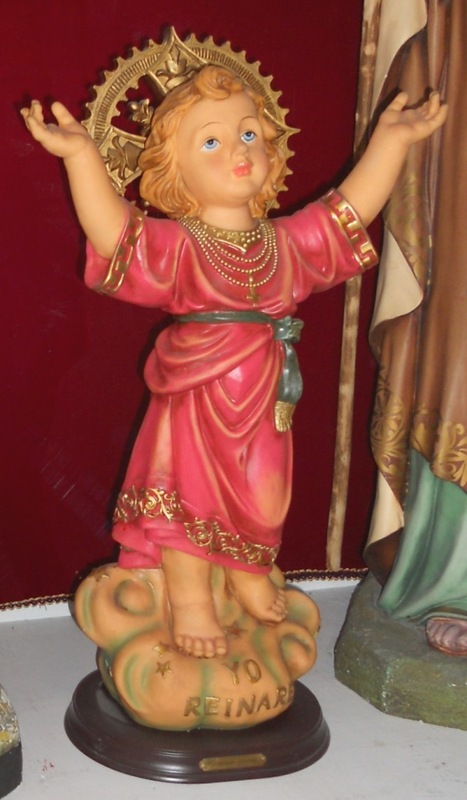 Working on the last post, I thought back to the three times I’ve seen Jesus in pink: At Our Lady of Guadalupe Church in Hebbronville; on the Child Jesus chaplet that Sister sent from the Flower of Carmel monastery in Australia; and, recently, at St. Anthony of Padua Church in Robstown, respectively. In 1914, Father John Rizzo, an Italian Salesian assigned to Bogotá, Colombia, was told to collect money with which to build a church. Having had no success since the townspeople were very poor, he prayed for the Blessed Mother’s intercession. And, only when Father Rizzo asked the Child Jesus for help did the church become a reality. In 1935, Father Rizzo was reassigned to another impoverished community where he continued his devotion to the Holy Infant. 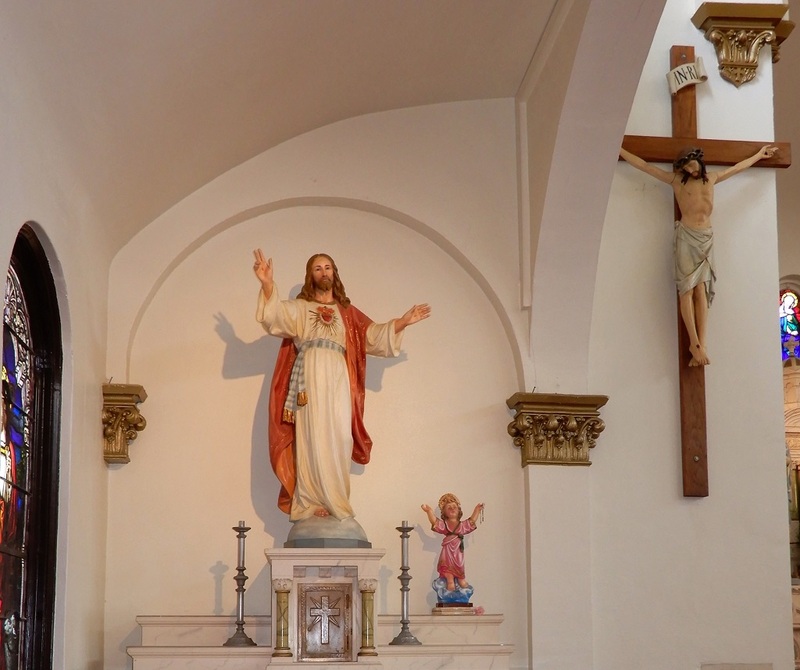 Only this time he chose a very special visual aid to use in his teachings and devotions— an antique statue of the Child Jesus from the shop of a local Italian artist— and, again, a church was built with a chapel within to honor the holy infant. Thanks to Father Rizzo, devotion to the Child Jesus grew. Miracles abounded, and the church soon became too small for the large numbers attending Mass. Although Father Rizzo died in 1957, long before the new sanctuary was completed in 1992, the statue he purchased decades earlier continues to grace Bogotá and inspire devotion to the Divine Child. 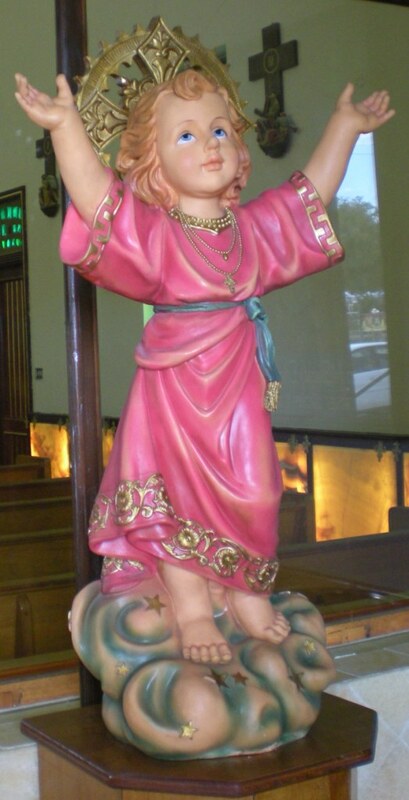 This beautiful statue of Jesus as a child, dressed in a pink tunic, with his arms wide open to receive us, and his innocent and loving smile is probably one of the most dear representations of our Lord’s infancy; it invokes in us a desire to embrace him and entrust all our cares into his loving arms (Padre Steve, 2008). O Infant Jesus, I run to you, begging you through your Holy Mother to save me in this need (name it), for I truly and firmly believe that your divinity can defend me. Full of trust I hope in you to obtain your holy grace. My resolution is to improve and never more to offend you. Therefore, I offer myself to you, ready to suffer everything for you and to serve you faithfully. I will love my neighbor as myself from my heart for the love of you. O Little Jesus, I adore you. O Mighty Child, I implore you. Save me in this need… that I may enjoy you eternally, with Mary and Joseph see you, and with all the angels adore you. The book with this prayer is displayed in front of the Infant Jesus of Prague at Our Lady Victorious Church in Prague, Czech Republic. There are more than one-hundred language translations of this prayer in the book. You learn to speak by speaking, to study by studying, to run by running, to work by working; and, just so, you learn to love by loving. All those who think to learn in any other way deceive themselves (St. Francis de Sales). “God always gives a greater blessing to humble beginnings than to those that start with a chiming of bells” (St. Vincent de Paul). 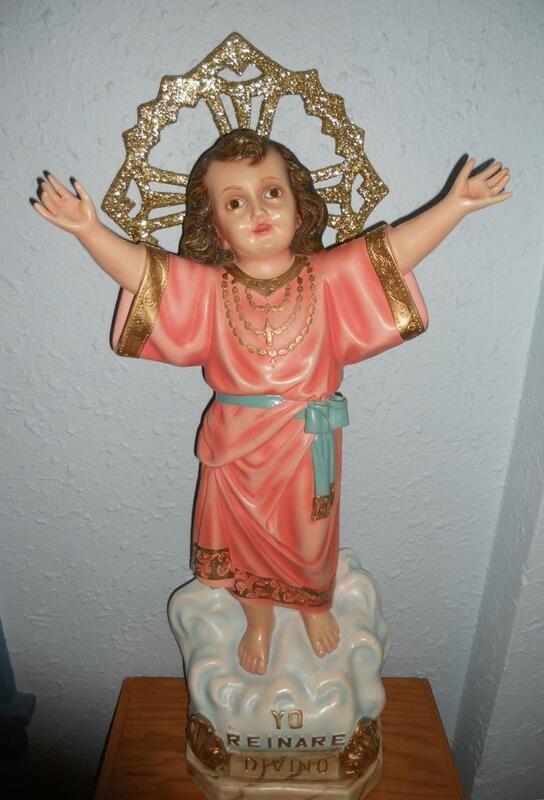 Child Jesus in pink, never seen or heard. Very interesting post which I read with great interest. I think that pink is not so generally used when talking about religious things or churches. I guess that you remember the pink church in Kemi. Like you, I couldn’t understand why or how the Infant would be in pink; but, having read Padre Steve’s account, I understand. The Infant statue was an antique in an artist’s shop. Who knows how it got there, who originally commissioned it, or why it was in pink? Could it have been for a child? For a personal chapel? I have so many more questions now; so maybe I’ll find out one day, hopefully sooner than later. Padre Steve did note, however, that Father Rizzo had requested two changes: In his usual easy, jocular manner, Father Rizzo said, “What! So little and already you want to crucify Him? Take off that cross and I will take it.” Father also asked the artist to place the words “Yo Reinare” (I will reign) at the base of the statue. And, yes, dear Matti. I certainly do remember your post on the pink church in Kemi. Thanks for your comments! Here’s wishing you and sweet Anja a wonderful day! Translation: Very nice pictures, calming yet lively. Very nice to have a nice evening. I wish you many greetings. I know what you mean, Klaus. Pink is a soothing yet bold hue. One must have confidence to wear it well. Here’s wishing you a peaceful evening.